I can't beleive I have 5 shows to write about and it has been just a week since my last entry....what a week! It all started on Tuesday when I showed up to the Orchard Lake Country Club in West Bloomfield, MI. at 5p.m. for what I thought would be a 3 hour gig. When I spoke with the event planner I learned it was actually a 5 hour show. Yikes! For a band, 4 hours is considered a full night of playing, so 5 is pushing the limits of energy. Luckily for me, I was with a great crew of players. Guy Barker on guitar, Lamar Woodall on lead pan, Big Kelly on the double seconds, and Anthony Tollson on the bass. It was a fun show. We did a lot of vamping while Kelly did some freestyle rappin about the night. He is a great performer, and very easy to play with. The night went by fast. I got home late and went right to bed to get ready for a big day on Wednesday. I woke up at 6a.m. ready to go for a big day at Go Like the Wind. It was the big Spring Concert and graduation night. It was a great event, although the logistics involved were complex. The concert was held at St. Luke Lutheren Church in Ann Arbor, so we had to get all the students on rented buses and down to the church to set up and rehearse, eat lunch, then get back on the bus to get back to school in time to be picked up. Sounds simple, but it took a lot of my energy. The concert itself went great. 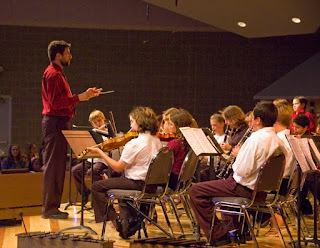 It was exciting to watch the students perfrorm so well in just their 2nd concert. I was a proud teacher, and I am now looking forward to next year more than ever. The next morning I was up early again to meet the Russell family for a one night stint on Mackinac Island. We were to play for a bunch of Michigans top politicians as part of the meeting of the Michigan Chamber of Commerce Annual Meeting. It sounded like a nice time, but it turned out to be a very tough job. We arrived at the island 2 hours before the show. Normally, this would be plenty of time to set up and play. In Mackinac, however, there are no motorized vehicles, so moving equipment around must be done by drey. A drey is a cart pulled by horses, and is the lifeblood of life on Mackinac island. When we got our equipment off the boat, the staff told us to head on up to the venue and our things would be up soon. We walked up to the Gatehouse, which used to be the French Outpost until it was bought by the Grand Hotel. We waited and waited for our things. They didn't show up for an hour and a half! So we ended up with a half hour to set up and start playing. Apparently we showed up on the island just as it was time to feed the horses. Oh well....this band was more than capable of a quick set up, and at least we made it! I had my drums set up in about 10 minutes and was ready to change into my 'Gratitude garb' when I noticed that my luggage was missing. Charles told me it was down at our hotel called the Windmere, so I ran down to the hotel to get it. When I showed up to the front desk they receptionist told me that she was all booked up, had not had a bit of luggage come to the hotel, and never heard of a steel band! Yikes! I went back to the venue and told Charles the bad news. It was time to play, so we had to wait till the first brake to call someone about our situation. He called a few people and no one knew where we were supposed to be. The guy who set everything up had to leave the island for some kind of emergency surgery, so no one had any answers. Luckily, the receptionist at the Grand Hotel was nice enough to hook us up with some rooms at the staff housing facility way up behind the Grand Hotel. We had to walk to it after our gig. It was about 2 miles from the show and was all up hill. By the time we got to bed it was about 2 a.m. and everyone was dead tired. We woke up early the next morning and got off the island by noon. It sort of felt like we never stopped traveling. We made it back downstate before nightfall, and I got some much needed rest. The next day it was off to Heinz Park where we were playing for some kind of community concert. Apparently, it was not very well advertised because no one showed up! The band was sounding so good. We were still reeling from the Mackinac experience and the lack of crowd was actually a nice break from the normal pressure of perfromance. We played for a couple of hours and then it was off to downtown Detroit for the 2nd annual Steel Drum Festival. Last year we were the opening band for the first ever steel drum festival and this year we had a spot right in the middle of the festival. Actually we were right after the Steelheads from Flint, so I got to see some of my old friends from my U of M Flint days. When the Steelheads started playing, heavy rain started to fall, so they had to turn off the power to the PA system. When we got up there we had no vocals, so the whole set had to be instrumental. It turned out to be really cool. The whole show felt like an affirmation of all the hard work this band puts into their art, and the crowd was very appreciative. I felt proud to be a part of it. Thanks for reading, and I will write again soon.